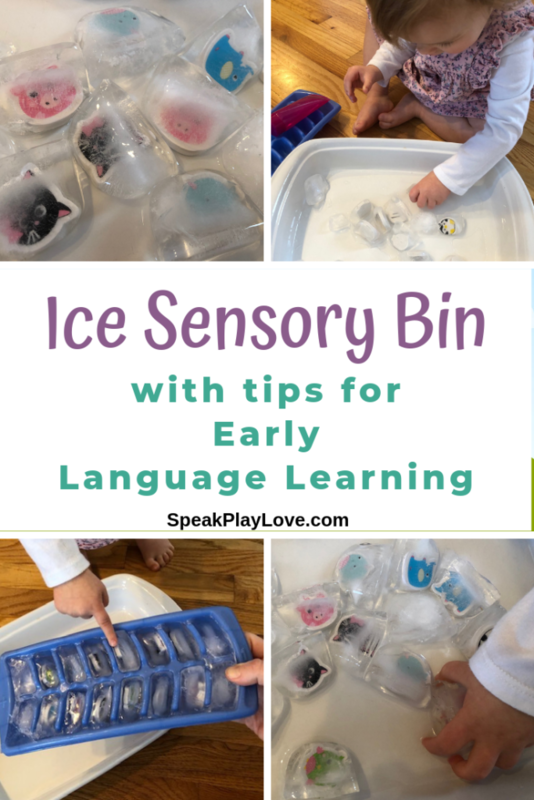 Using Ice Cube Activities for Early Language Learning | Speak. Play. Love. 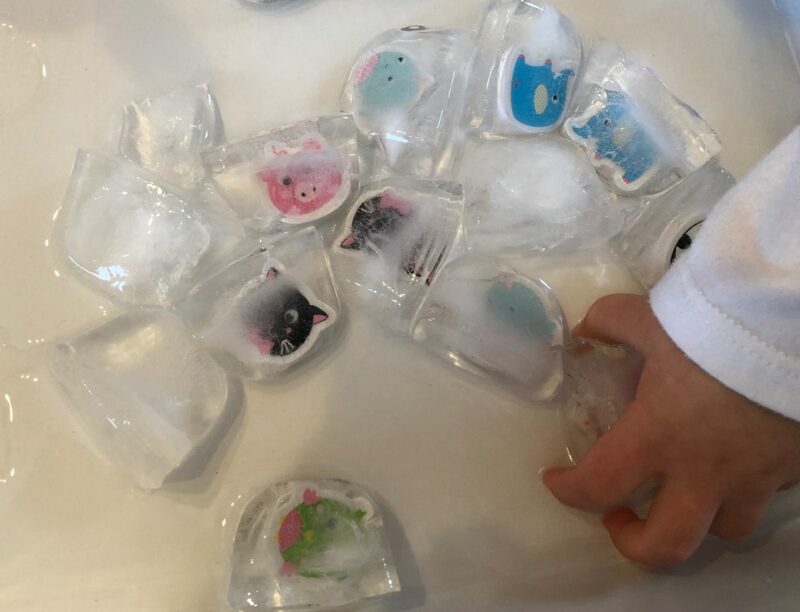 Even though it’s freezing where we live right now, my toddler loves doing ice cube activities inside! Since I introduced this activity about two weeks ago, she asks for “Ice Animals” every single day. 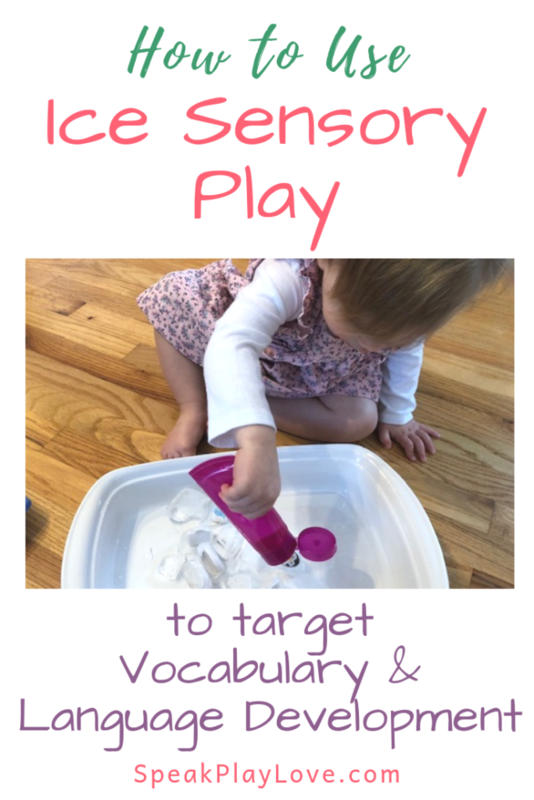 I love taking a sensory play idea, like ice sensory play for toddlers, and adding other early learning ideas to the activity. 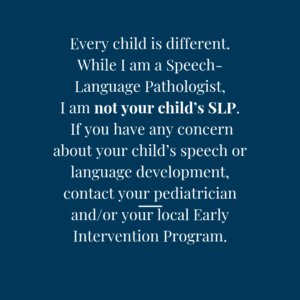 As a Speech-Language Pathologist, I’m always looking for ways to add a language development angle to any activity and this one didn’t disappoint! 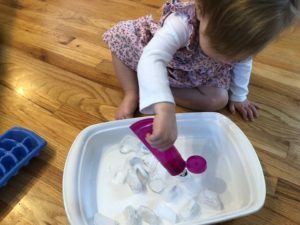 The contrast of temperatures is the central idea for this sensory bin idea – the ice is cold and I paired it with warm water in squirt bottles. If you were doing this in the summer, you might not even need the warm water! She got to work on pouring, squirting and trying to grab slippery ice cubes. 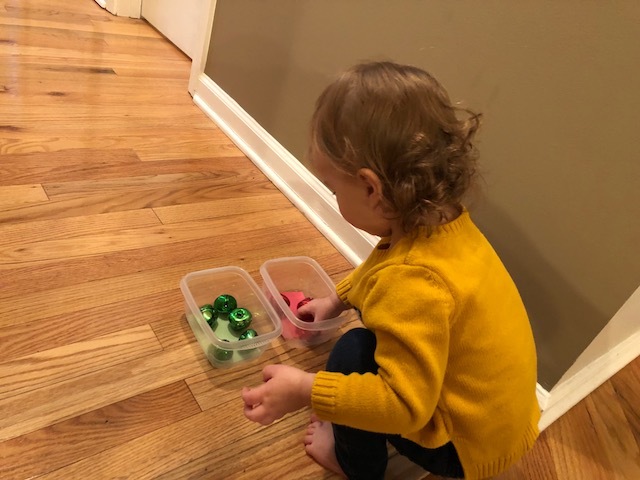 The first few times she did this activity, we did it as an interactive-play, learning activity, but now she plays with it independently while I work on other kitchen tasks. Just be sure to put down a towel to keep the floor dry! Items small enough to freeze in the ice tray. Try to pick items that target vocabulary you are working on. For this activity, I chose animal erasers (there are two of each type of animal, so it’s also perfect for matching!) 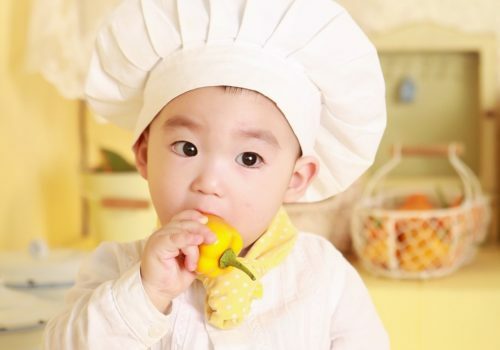 *Please supervise your child if she puts items in her mouth – items this size are a choking hazard. A towel (I didn’t use one in these pictures, but I was sitting right next to her. In subsequent play sessions where she plays more independently, I always have her help me set up the area with a towel, pan, squirt bottles, etc. 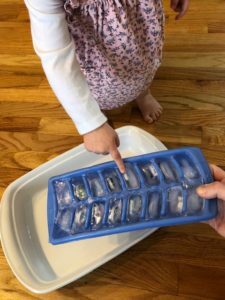 Have your toddler help you put the items in the ice cube tray. This is a great time to preview the vocabulary of what you are freezing. Put the tray(s) in the freezer. Dump the ice into your bin/pan. 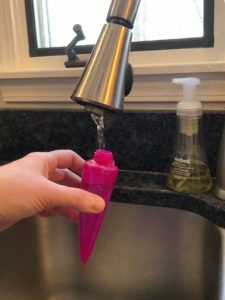 Put warm water in your squirt bottles. Put out any other tools you think your child might like. 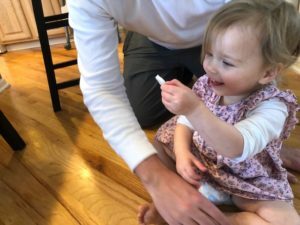 We tried a spoon and tongs, but she mostly enjoyed using her hands! 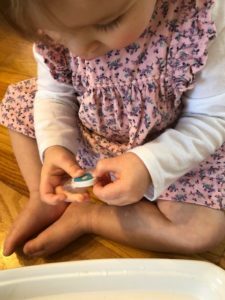 Example: When your child needs help with the activity (maybe getting an eraser out of ice cube), prompt him to ask for “help” either with his words (“Say, ‘Help’”) or with sign language. 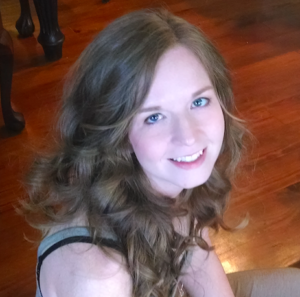 You can search for words using this video sign language dictionary. We used animals, but you can freeze anything! Our eraser pack came with two of each animal, so we were able to do a matching activity. 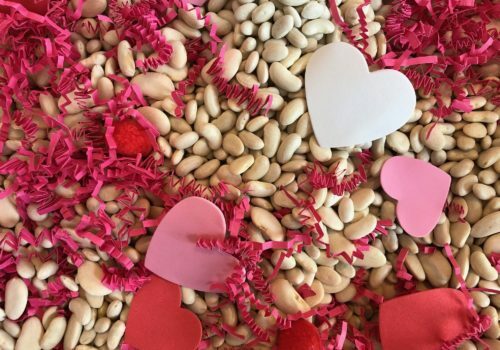 I hope your little one enjoys this activity as much as we did! What type of sensory activities your child like to do? Please share your favorite activity below in the comments!